Jodi has performed extensively in opera, musical theatre and solo recitals as well as BBC radio dramas and TV. Jodi Penner, originally from California, finished her M. Mus. in voice at the University of Alberta, 2011 and her Bachelor of Arts in Music from Liberty University, 1997. Jodi is an accomplished soloist and actor with many performing credits around the world including United States, Canada, Scotland, Russia, Italy, Austria, and Bolivia. Ms. Penner has studied with Elizabeth TaSelle, Dr. Wayne Kompelein, Brian Macintosh, and Elizabeth Turnbull. She has sung the National Anthem at Candlestick Park for the Giants in 1992 and 1993 July 4th games and also was featured as a young artist with the Redwood Symphony in California singing Chants d' Auvergne. 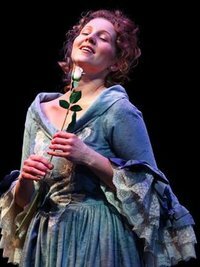 She has performed roles with Opera Roanoke, Operafestival di Roma, Edinburgh Fringe Festival, Rosebud Theatre, and has sung with Canadian Chamber Choir, Edmonton Opera Chorus, i Coristi, Pro Coro, Entrecantos, Orquesta Filarmónica, and Trio Internaciónal. She was also invited to sing a concert with classical guitarist, Alberto Puerto at the Cochabamba Bachfest, Bolivia. She has performed in Cotton Patch Gospel, A Funny Thing Happened..., St. Nick's Magical Mystical Mystery Tour, Candide, as well as the roles of Romilda in Handels' Serse, Papagena and First Lady in the Magic Flute, Donna Elvira in Don Giovanni, Valencienne in the Merry Widow, Rosabella in The Most Happy Fella and Aldonza in Man of La Mancha. Ms. Penner is also active as a recitalist and has collaborated with pianist Connie Canfield and Mezzo-Soprano Caitlin MacRae in a recital tour of Alberta and British Columbia, pianist Jeremy Spurgeon, pianist Robin Philips (South Africa), pianist Magda Adamek, pianist Alicia Torrea (Spain), classical guitarist Alberto Puerto (Cuba), pianist Yuliya Ogurstova (Ukraine), and Trio Internaciónal to give solo concerts. Jodi also premiered a song cycle by Chilean composer Raimundo Gonzales based on his music research in the Amazon rainforest. A recipient of several NATS regional competition awards, the Beryl Barnes Award, Johann Strauss Award, Carol Mallet Award, and Canada Council for the Arts Grant, she also had the honour to attend the Franz Schubert Institute in Austria for the advanced study of Lieder. Her teaching credits include Prairie Bible College, Rosebud School of the Arts, Interim Head of Music at Rosebud School of the Arts, University of Alberta, Universidad Evangelica de Bolivia as well as being co-founder of Arts Alive in Kneehill. Jodi's solo album entitled Tree in a Storm that has received great reviews. Recently, she has expanded into choral directing with The Santa Cruz International Community Choir, Escuela de Music de Santiago de Chiquitos, and Coro Filarmonica de Santa Cruz. Jodi has been teaching voice for 20 years in U.S., Canada and Bolivia.